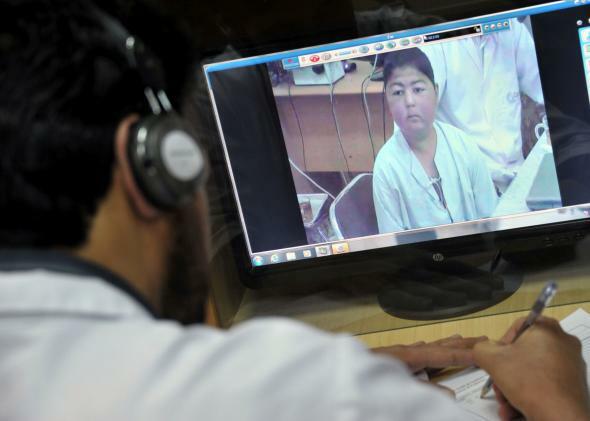 Telemedicine revolution: UnitedHealthcare insurer will now cover virtual doctor's appointments. Your next checkup might take place in virtual reality. The country’s largest health insurer is putting telemedicine on par with a regular trip to the doctor’s office, effectively saying a video visit is as good as brick-and-mortar medicine. UnitedHealthcare announced on April 30 a partnership with three telemedicine companies to cover video-based doctor visits just as it covers in-person visits. The tech set has for decades predicted that we would one day get our medical care via video chat, but it wasn’t until recently that forward-thinking physicians started taking the promise of telemedicine seriously. The decision by so influential a player in the health care industry to telemedicine is the strongest sign yet that the technology is entering the mainstream. United says it will cover virtual doctor visits offered through NowClinic, Doctor on Demand, and American Well. These platforms connect patients with thousands of doctors—albeit not the patient’s usual doctor—via video chat. These consultations typically cost $40 to $50 a pop, but now that United is covering these visits, members will only have to pay their usual co-pay, making virtual medicine much more affordable for more people. For now, these virtual visits will be available only to UnitedHealth’s self-funded customers, but the feature will expand to most members by next year. Of course, helping others isn’t the only motivation. By offering telemedicine services, health insurers stand to substantially lower their costs, because virtual visits are significantly cheaper than urgent care or even primary care visits. Much as online retailers did to brick-and-mortar shopping, telehealth companies have used technology to eliminate most of the overhead that contributes to the high cost of health care. And United is not the only company that’s noticed. Newer insurers like Oscar as well as established ones like WellPoint and some BlueCross BlueShield plans have also adopted telemedicine programs in recent years. Jackson, for one, says Doctor on Demand’s biggest users are working mothers, who have lots of questions about their kids’ health but can’t take a day off of work to bring them to the doctor whenever they have the sniffles. Instead, they can fire up their phones, wait a couple minutes, and have access to one of 1,400 licensed physicians who can provide them with a diagnosis and a prescription all by video. According to Jackson, around 92 percent of cases on Doctor on Demand require no in-person follow up. And this type of telemedicine treatment is only the beginning, says Dr. Roy Schoenberg, CEO of American Well. Already, his company has been working with large hospital systems like Cleveland Clinic and Massachusetts General, which have been using their technology to treat even serious conditions like cancer and heart disease. “These organizations are beginning to understand that the care they can extend to you can be dramatically different if they can continuously see you at home, when you’re undergoing long-term treatment,” Dr. Schoenberg says. He expects this type of use case to grow. Meanwhile, he says we may soon see a day when services like American Well can connect you not just to any old doctor, but to your own doctor.